blind men and elephant fish 맹인들과 코끼리 물고기: Would you like some AIDS with that? Would you like some AIDS with that? While working in the Gambia I happened to meet an enterprising Gambian man who had what he thought was a brilliant idea. Even far out in his little rural village this fellow knew that money for AIDS awareness workshops was pretty easy to come by. Now he himself wasn't much interested in AIDS, but he was very interested in beekeeping. So he asked me to help him get money for an AIDS workshop at the local high school at which each student would be given, not condoms, or even speeches on the glories of abstinence, but their very own beehive. And because the students were so diligently engaged with their studies this charitable Gambian man would even take it upon himself to manage those beehives on their behalf, in exchange for a healthy percentage of the honey that they produced. Although sorely tempted, I had to turn this budding entrepreneur down. Fast forward several years and I find myself reading over a report of a coastal management project in Tanzania in which that project documents how it took upon itself the task of formulating an AIDS awareness Training Guide and running AIDS awareness workshops. I can't say that I am surprised. 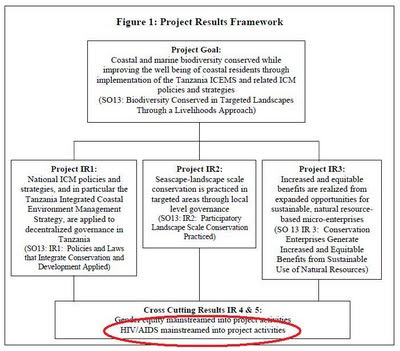 Nor was I surprised to see the sloppy, awkward, and dare I say mildly humorous way, in which it was shoe horned into this coastal management project's "Results Framework." How would you like to have some HIV/AIDS mainstreamed into your activities? A slice of American decadence anyone? Another good development economist at Yale. Greening the Greens with all natural golf karts?